Managing money in the midst of life’s other priorities is no easy task. Women of all ages and backgrounds struggle with the pressure to earn enough, access education, care for a family and plan retirement. Taking the initiative to educate yourself about complex financial decisions will help you achieve your next major milestone. Every informed financial decision you make gets you closer to that goal. 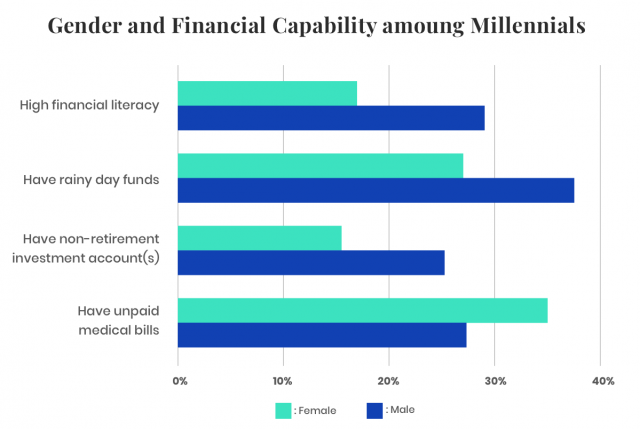 Women are three times as likely as men to say they can’t afford to save for retirement and have significantly lower rates of financial literacy. Women also make up the majority of caregivers, and are three times more likely than men to quit their jobs to care for a family member. Generally speaking, women earn less, save less, and live longer — but are still responsible for the same living expenses men pay. And since they live longer, they face additional costs, including more long-term and overall health care expenses. Overcoming these obstacles demands serious dedication to planning. Learning how to increase earnings and make use of available resources to the fullest potential can help you make the most of paychecks and approach financial choices with confidence. Women who reach the age of 65 are expected to live more than two years longer than men who reach 65. More than 80 percent of older women taking part in a 2017 study couldn’t pass a retirement financial literacy quiz. Nearly twice as many of their male peers were able to pass. Women are not expected to reach pay equality for the next 43 years. Low literacy rates dramatically impact the lives of women, demanding they work harder, take more time to pay debts and, sometimes settle for earning less. The U.S. Department of Education reports that 3.8 million American adult women possess literacy skills below a “basic” level. The basic level refers to reading, writing and math skills at a third-grade level. This lack of education makes it difficult to understand bank statements, credit card agreements and other financial documents. Those who passed were more likely to have a retirement plan, as well as a plan to cover the costs of long-term care. Women lacking competency in financial literacy face serious repercussions, such as taking on large amounts of credit card debt, defaulting on student loans, and experiencing difficulty managing income, taxes and investments. Today women have a higher likelihood than men of completing college and graduate school. Unfortunately graduation doesn’t guarantee financial stability. Student loans follow many graduates well into careers, and women face serious obstacles when it comes to debt repayment. As women dedicate more post-college earnings to monthly loan payments than men, they are drawing from paychecks that often are significantly smaller than a man’s income. Paying loans from their limited resources leaves less money to save for other financial priorities, like buying a home or building retirement savings. Fatima Goss Graves, vice president for education and employment at the National Women’s Law Center, recommends women pursue career options with high earning potentials. She points out that there aren’t enough women in science, technology, engineering and math fields. Participation in the work force has unique implications for women. An unfair wage gap and life interruptions can slow career progress and force some women to struggle with basic living expenses. When women take breaks from their career for childbirth, raising children and taking care of elderly parents, they often sacrifice the momentum they’ve gained from working in their field. In the United States, women make up 46.9 percent of the labor force, although that number is expected to fall slightly in the coming years. On average, women are paid less, making about 20 percent less than men working full time. Women’s median weekly earnings for full-time work were $770 in 2017. For men, that number was $941. Women are also much more likely to work part time than men. The Institute for Women’s Policy Research in 2017 said the gender pay gap had a statistically significant reduction in the previous year for the first time since 2007. Yet researchers said equal pay will not be achievable for 43 years. At the same time, more women have joined the labor force — making up 47 percent of workers, compared to 38 percent in 1970. While more single women are becoming homeowners, the long-term burden of paying a mortgage is no easy task. In the 1990s, single women began outpacing single men in home ownership. They outnumber men in the categories of first-time home buyers, repeat home buyers, living alone, owning a home, and in spending half their income on housing, according to the National Association of Realtors. 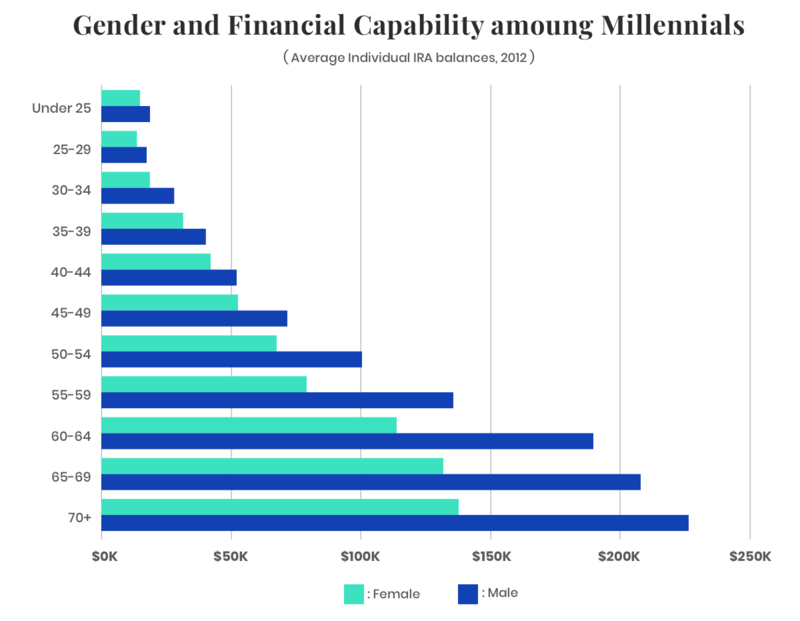 Twice as many millennial women compared to men plan to own homes. If you’re spending 15 to 30 years paying a high-interest mortgage, it can make putting aside cash for emergencies and retirement savings difficult. Women are pay higher interest rates on mortgages than men — an average of 0.4 percent, according to a 2011 study by the Journal of Real Estate Finance and Economics. Nearly half of marriages end in divorce and, in many cases, women encounter financial consequences with higher levels of severity than men. Legal fees, tax liabilities and complications from dividing assets make divorce expensive, and it can take years before financial recovery is possible. Unlike other financial matters, divorce is hard to plan for. Emotional stress and household tension accompany the financial burden, and the legal process can take months or years to resolve. The majority of women retain custody of children, and struggle to make ends meet because of the high cost of child care. Some women without children also find themselves having to adjust to a lower standard of living following divorce. One in five women falls into poverty because of divorce. Three out of four divorced mothers don’t receive full payment of child support. About one out of every three women who own a home and have children lose the house after divorce. About a third of working women can’t meet an unexpected $2,000 expense within 30 days. A man reaching 65 today will on average live to 84.3 compared to a woman’s 86.6-year lifespan, according to the Social Security Administration. With women having longer lifespans, the amount of savings needed for retirement grows. Single women of all types — unmarried, divorced and widowed— from age 44 to 64 are underprepared for retirement. IRA and 401(k) balances fall short compared to male equivalents. Single and married women tend to focus on priorities other than retirement, like paying for their children’s needs and owning a house. One of the worst outcomes of not prioritizing savings is missing opportunities to leverage time in your favor. Money kept in interest-bearing accounts for years can grow into a substantial asset. Employer-offered accounts include tax advantages and sometimes match plans that double savings. The wage-earning gap also limits available Social Security benefits — a built-in foundation that some seniors rely on for retirement expenses. As a result of these challenges, fewer resources and a lack of planning, women are more likely to encounter poverty in old age and be forced to rely on government programs for living expenses. Improve your financial welfare by making a plan for how you will use your paychecks wisely. The power to make good spending and saving choices is yours. You can get a free annual credit report at AnnualCreditReport.com, which is authorized by federal law as the official site for free annual credit reports. Then purchase your actual credit score from one of the three credit bureaus. By writing down paid off debts, you can track your progress and celebrate small victories. Paying off debt will be easier once you start setting limits for yourself and recognizing the difference between needs and wants. With a few online banking clicks, you can set up automatic deductions from your direct-deposit debit card to an interest-earning savings account. Stop ignoring debt collectors and find out if you can negotiate affordable payments, rather than racking up more late fees. The Women’s Institute for Financial Education is a non-profit organization which began in 1988 and provides guidelines on cost of living, retirement planning, taxes, divorce and widowhood. Women’s Institute for a Secure Retirement (WISER), a nonprofit organization dedicated to increasing long-term financial welfare for women, with a focus on retirement security. The group developed the National Resource Center on Women and Retirement Planning, which has a collection of free resources for basic financial planning. Site visitors can take advantage of guidance regarding divorce planning, estate planning, home ownership and caregiving information. The Financial Literacy Organization for Women and Girls (FLOW) is a charitable organization dedicated to empowering females of all ages to achieve their financial best. It hosts conferences, seminars, workshops and boot camps to assist women in financial independence. Next Topic What Is a Fiduciary?